This is a collage piece I made for the Eastercon art show, pretty much entirely as an experiment. 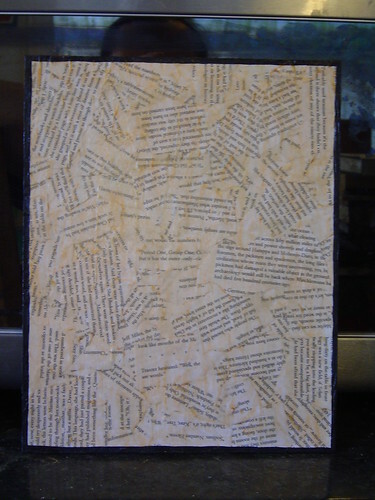 It’s one of my favourite SF short stories, Omnilingual by H Beam Piper (Project Gutenberg link) done using your basic papier-mache technique on a Daler board base. The discolouration is done with two layers of tinted glaze (gold, then brown) and edged with black acrylic. I’m quite pleased with the result, and I think I’ll have to do some more of these in the future.